Journal photos by Ingrid Howard. 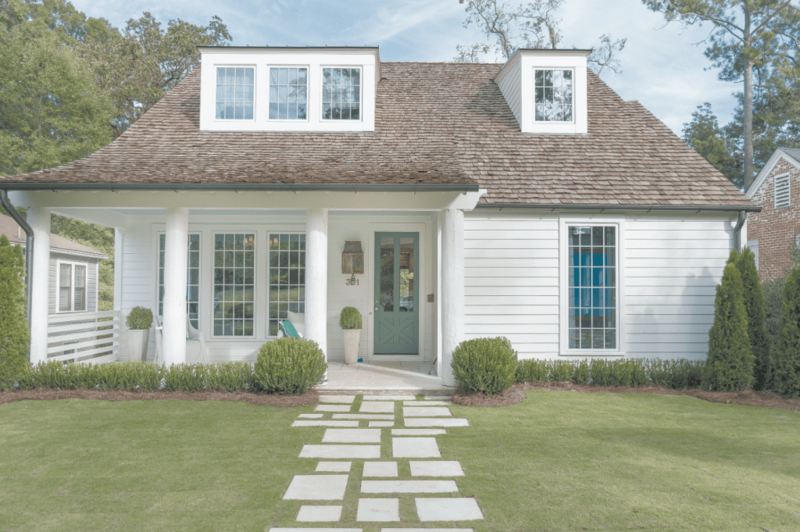 When you’re walking down Woodland Drive in Homewood, the 2018 Birmingham Home & Garden Inspiration Home looks like any other charming Homewood house: a small, cottage-style house nestled comfortably between its neighbors. What people can’t see from the sidewalk is that this home is a four bedroom, 3½ bathroom house made up of three spacious levels. 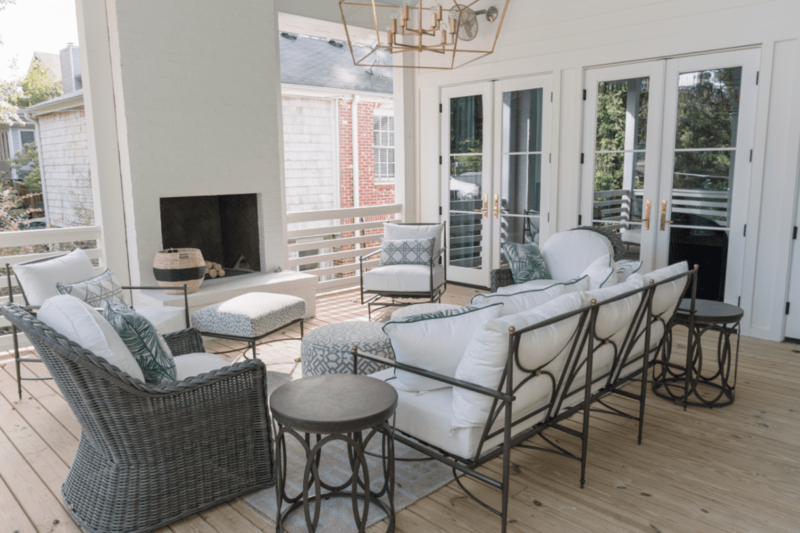 This house is Birmingham Home & Garden magazine’s ninth Inspiration Home. A team of architects, designers and builders come together to transform a home and showcase their best work. People tour the home for $10 a person. Richard Long and his wife, Lynielle, had a few tricks up their sleeves to keep the scale of the house small. The architectural design of the roof lines hides the expansive third floor. The basement level is hidden by the lot’s sloping landscape. 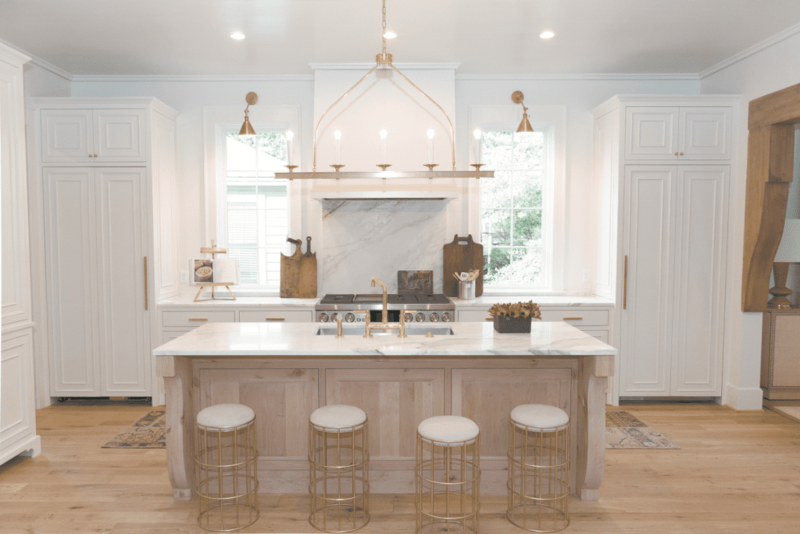 Top, the 2018 Birmingham Home & Garden Inspiration Home is located at 321 Woodland Drive in Homewood. Above right, tall, white cabinets make up the kitchen, and the refrigerator and freezer hide in two of the floor-to-ceiling cabinets. 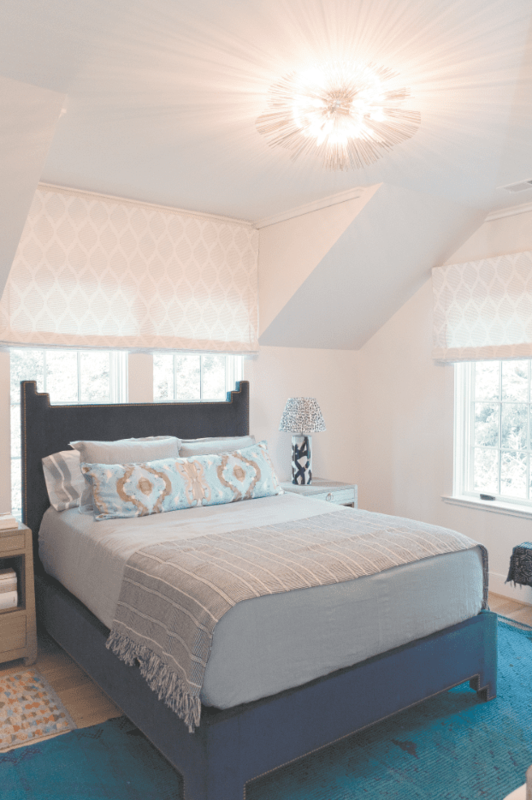 Each room of the house has a sponsor who is overseen by Jan Ware, the design liaison. 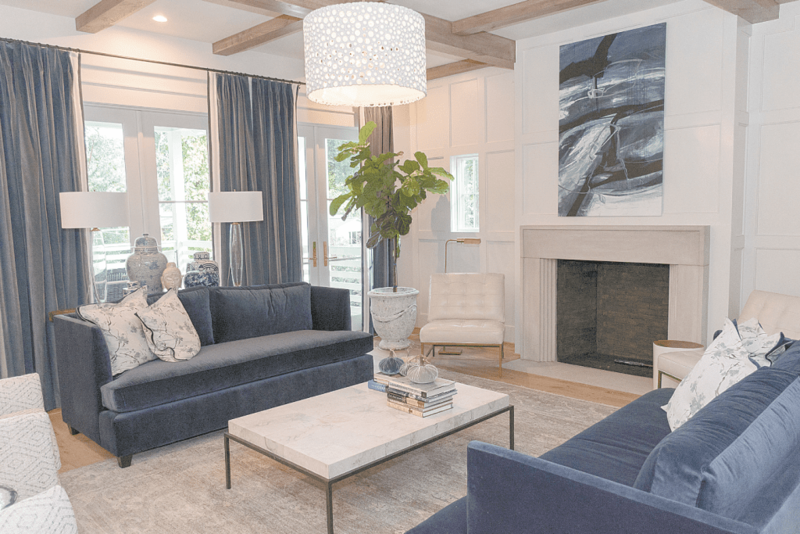 The room sponsors each decorate their own rooms, but Birmingham Home & Garden magazine editor Cathy Still McGowin said this isn’t your typical showroom. Above, the master bedroom has a vaulted ceiling, and the headboard of the bed nearly reaches to the top. In most of the rooms, the floors are made of white oak. Richard Long said the use of white oak on floors is a trend he is seeing more and more. “When you put it in a room, whether it’s on the floor or the wall, it’s hard to change it in a dramatic way with stain because it’s so beautiful left raw,” he said. Each bedroom is a modest size, and all four find different ways to make a statement. All of the upstairs bedrooms have sloped ceilings. The master bedroom has a vaulted ceiling, and the headboard of the bed nearly reaches to the top. “Instead of eating up space with a big, tall bed, (decorator Pam Evans) used a platform bed and a tall headboard, and the architects lofted the ceiling,” McGowin said. Each bedroom has lots of closet space, which Richard Long said is uncommon for Homewood. In the master bedroom’s massive, walk-in closet, there is space for a washer and dryer, separate from the upstairs laundry room. Another element of this house uncommon to its neighborhood is the basement. When Richard and Lynielle first saw the original house, it already had a basement, but it had problems, such as low headroom. They were able to clean it up and said the next owners could use it as a wine cellar or for storage. Also downstairs is a den that connects to covered parking. The Longs made this possible by adding on a porch to the back of the house, which features a fireplace and plenty of room for entertaining. The porch wraps around the family and dining rooms, with tall windows that allow natural light to pour in. Tall, white cabinets make up the kitchen, and the refrigerator and freezer hide in two of the floor-to-ceiling cabinets. But if all of that storage isn’t enough, the kitchen also has a scullery. After graduating from Auburn in 2004 with degrees in architectural design, Richard and Lynielle Long went their separate ways. Richard landed a job with the old Dungan-Nequette firm, and Lynielle moved to Philadelphia to teach design in a high school. In most of the rooms, the floors are made of white oak. Richard Long said the use of white oak on floors is a trend he is seeing more and more. Above, the living room. They stayed long-distance friends until Lynielle moved to Birmingham to work for Cohen Carnaggio Reynolds. The two reconnected, got married and started a family. They have had their own architecture firm, Long & Long Design, since 2015. The pair take on different tasks within the company — Richard starts the design process, Lynielle picks up in the middle, then Richard puts on the finishing touches. 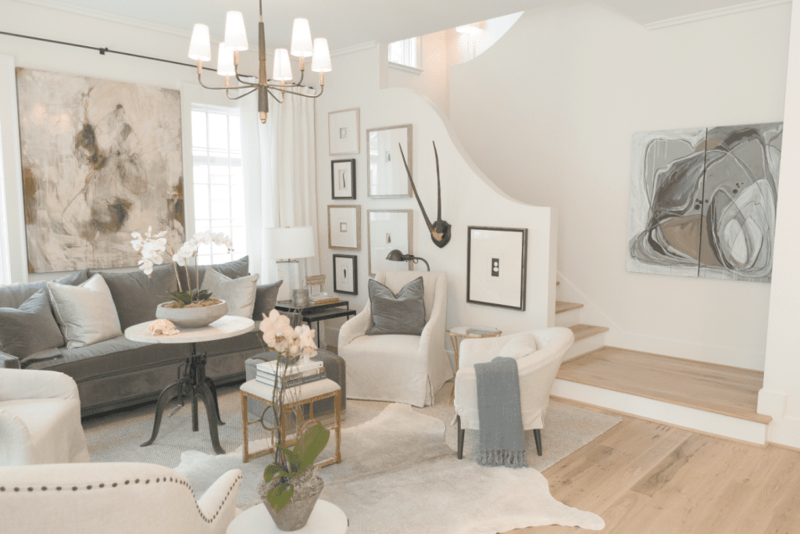 Before the couple was approached to be a part of the Inspiration Home project, they were supporters of The WellHouse, which is one of the Inspiration Home’s charity partners. The WellHouse is an organization that offers a home and support services to women who have been sexually exploited through human trafficking. The Longs mostly offer financial support, but they also help with designing. “It’s good to empower women to be able to stand on their own two feet after it’s been taken away from them like that,” Lynielle said. Shortly thereafter, the leaders behind Francis Bryant Construction approached the Longs to see if they would be the architects for the Inspiration Home. Richard said they were eager to accept the challenge. One of Richard’s favorite things about being an architectural designer is drawing the homes by hand. For Lynielle, it’s all about the details. A porch to the back of the house, which features a fireplace and plenty of room for entertaining. The Inspiration Home will be open for tours until Nov. 25. Tickets can be purchased at birminghamhomeandgarden.com/inspiration-home.